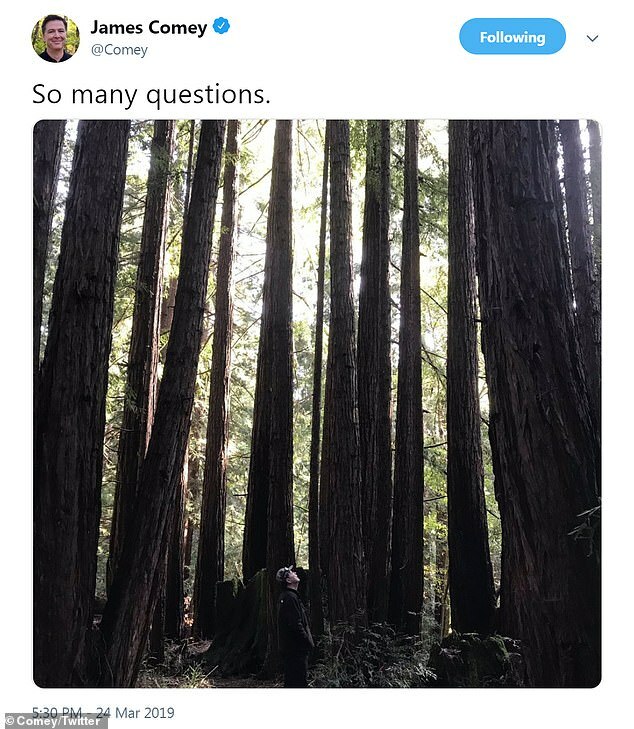 Former FBI Director James Comey tweeted an image of himself in a forest surrounded by trees with the caption ‘so many questions’ on Sunday. The cryptic tweet was sent after the attorney general sent a letter to Congress sharing the findings of special counsel Robert Mueller’s investigation. Comey’s tweet implies Mueller and his investigative team became so caught up in the minutiae that they didn’t appear to pay attention to the most important allegation of Trump and his alleged collusion with the Russians. Nevertheless, Attorney General William Barr told Congress that Mueller did not find evidence that that the Trump campaign conspired or coordinated with Russia to interfere in the 2016 presidential election. Senator Lindsey Graham (R-S.C.) on Sunday celebrated the news that Special Counsel Robert Mueller did not conclude that Trump or his associates conspired with Russia to influence the election. 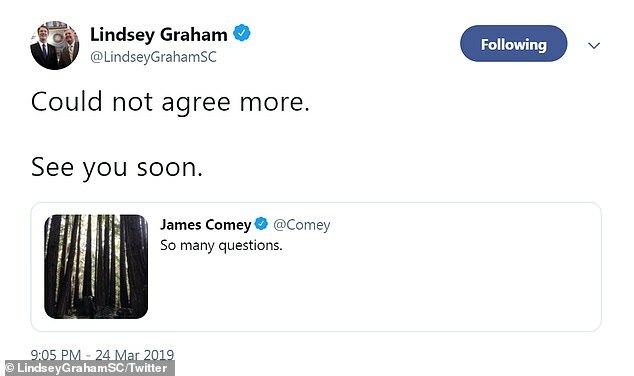 Later on Sunday Graham tweeted at Comey, ‘Could not agree more. See you soon.’ implying the former FBI director may be called before congress to explain himself in the near future. The letter also said that Mueller and his team had not reached a conclusion on whether Trump obstructed justice while being president. Barr added that he and Deputy Attorney General Rod Rosenstein had decided not to pursue an obstruction charge after reviewing the special counsel’s findings. Democrats say they want more answers from Barr on Mueller’s findings and how Barr and Rosenstein made their decision on not pursuing obstruction charges. The president’s critics had long pointed to his firing of Comey as evidence of possible obstruction. 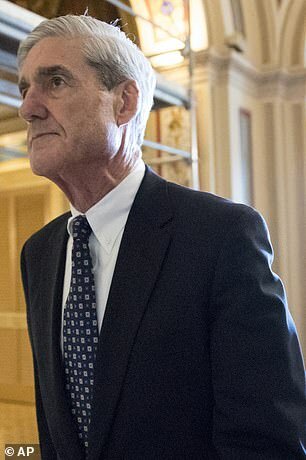 The firing led to the appointment of Mueller as special counsel. 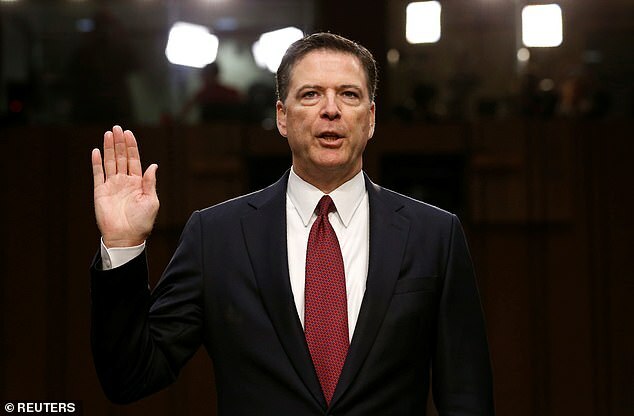 Since being fired, Comey has been a frequent public critic of Trump with him frequently calling him out at times on social media. Comey’s tweets are often cyptic, with quotes from historical figures or photographs of the former FBI chief from his travels. Attorney General Barr said in a three-page memo to top-ranking lawmakers on the committees with oversight over the Justice Department that he is still reviewing Robert Mueller’s findings. He said he made the decision in concert with Deputy Attorney General Rod Rosenstein, and it was not ‘based on’ the implications of indicting a sitting president. Rather, they concluded after reviewing Mueller’s work they could not prove ‘beyond a reasonable doubt’ that Trump intended to obstruct justice. Democrats immediately suited up for a new fight with Trump and his hand-picked attorney general. ‘In light of the very concerning discrepancies and final decision making at the Justice Department following the Special Counsel report, where Mueller did not exonerate the President, we will be calling Attorney General Barr in to testify before @HouseJudiciary in the near future,’ Nadler said in a tweet. House Democratic Caucus Chairman Hakeem Jeffries likewise said that Barr must submit to a congressional grilling. Democratic Congressman Sean Patrick Maloney said he’d prefer to hear from Mueller himself for the same reason. ‘Would rather have the report from the guy who spent two years investigating than a summary from the guy who spent less than two days reading it. Need the whole thing,’ the New York congressman said in a tweet. 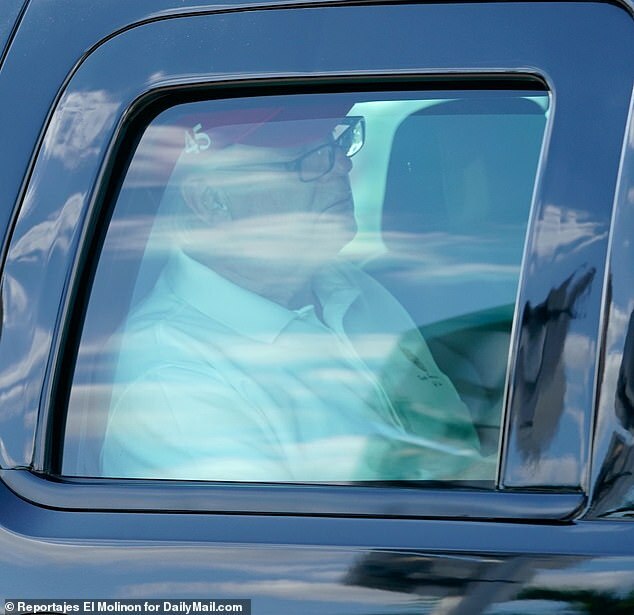 The president and the White House were already at work driving a narrative that Trump was ‘exonerated’ based on Barr’s second-hand description of the special counsel’s findings. House Speaker Nancy Pelosi and Senate Minority Leader Chuck Schumer said in a joint statement that Trump’s claim ‘is not to be taken with any degree of credibility’ as they reiterated an earlier call for total transparency in the special counsel investigation. Rep. Mark Takano of California noted that the House of Representatives unanimously passed a resolution to make the Mueller report public prior to its completion. ‘This is about transparency and truth — and a 4 page summary from Trump’s AG doesn’t cut it. The American people deserve to see the whole thing,’ he said. Barr’s allegiance to the president who appointed him had some Democrats arguing on Sunday evening that DOJ must provide the Mueller report and other documents to Congress immediately. ‘Maybe Barr’s interpretation is right. Maybe it’s not. But why the heck would we be ok with an ally of President, appointed because of his hostility to the Mueller investigation, tell us what the report says? Give Congress the report. Give the public the report. Now,’ said Connecticut Sen. Chris Murphy in a tweet. Colleague Richard Blumethal, also of Connecticut, said, ‘Key questions remain about whether Donald Trump was compromised as a candidate & is now as President of the United States. Ongoing investigations in other federal prosecutorial offices as well as the FBI’s counterintelligence inquiry must be supported. Nadler vowed Democrats will continue their investigation as to whether President Donald Trump or anyone on his campaign team worked with Russia earlier in the day, prior to the release of Barr’s letter. Nadler pointed to the infamous Trump Tower meeting in June of 2016 when then-campaign manager Paul Manafort, Donald Trump Jr. and Jared Kushner met with a lawyer with ties to the Kremlin who claimed to have information on Hillary Clinton’s campaign. ‘We know that the president’s son and campaign manager were involved in a meeting with the Russians to receive stolen – what they thought was to receive information stolen from the Russians by the Democratic National Committee, as part of the Russian government attempt to help Trump in the election. That’s the way the e-mail inviting them to the meeting put it,’ he said on CNN’s ‘State of the Union’ on Sunday morning. He conceded none of what he cited has resulted in indictments from the special counsel. ‘No, it hasn’t, as far as we know. But we know there was collusion. Why there’s been no indictments, we don’t know. Let me say further, we know a number of things. We know what I just said,’ he said. He also referred to former FBI director James Comey’s allegation that President Trump asked him to ease off a federal investigation of then-National Security Adviser Michael Flynn and his meetings with Russian officials. ‘We know that the president pressured the FBI to go easy, to stop investigating Flynn and various other people. We know that he fired the FBI director, as he put it to NBC, to take care of the Russian thing, in order to stop the investigation of various people associated with him. We know that he concocted the lie about the purpose of that Russian meeting. We know that a lot of his top associates have been indicted and convicted, and we know that he has engaged in a relentless two-year attack against the FBI, various law enforcement agencies,’ Nader argued. Prior to Barr’s letter, Nadler suggested that because it is the Justice Department policy not to indict a sitting president, if Trump did do something wrong then it was up to Congress to hold him accountable. ‘The Justice Department believes that as a matter of law, the president, no matter what the evidence, can never be indicted,’ Nadler said. ‘If that is the case then they can’t hold him accountable and the only institution that can hold the president accountable is Congress and Congress, therefore, needs the evidence in the information,’ he said on ‘Fox News Sunday. Nadler said that is why lawmakers needed to obtain the underlying documents and evidence Mueller used to come to his conclusion and did not rule out using his subpoena power to get them. ‘We’ll use subpoenas if and when we think we have to,’ he said. Republicans were quick to hit back, charging Democrats with a fishing expedition because of fears Mueller’s report would exonerate the president. 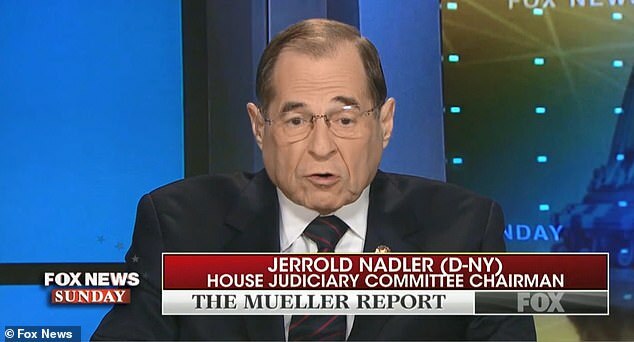 Nadler made the rounds of the Sunday morning shows as Capitol Hill waited for the Justice Department to submit Mueller’s findings to Congress. He argued Congress has to look at the bigger picture than Mueller did under his charge as special prosecutor. ‘The special prosecutor is limited in scope, his job was limited in scope and limited to crimes. What Congress has to do is look at a broader picture. We have the responsibility of protecting the rule of law,’ Nadler said on ‘State of the Union’ on CNN. He also said Democrats were ‘absolutely’ willing to go all the way to the Supreme Court to obtain the full Mueller report. He wouldn’t say if congressional investigators had enough information to charge Trump and said they needed to see Mueller’s findings first. ‘I think we have to see all the evidence. And there may be evidence that goes the other way. There might be evidence that tends to be exonerating. We need to see all the evidence. And we shouldn’t have to waste our time and the public’s time and money recreating the same information by interviewing all the same witnesses. There’s no need for that duplication at all,’ he said in a third interview on Meet the Press’ on NBC News. 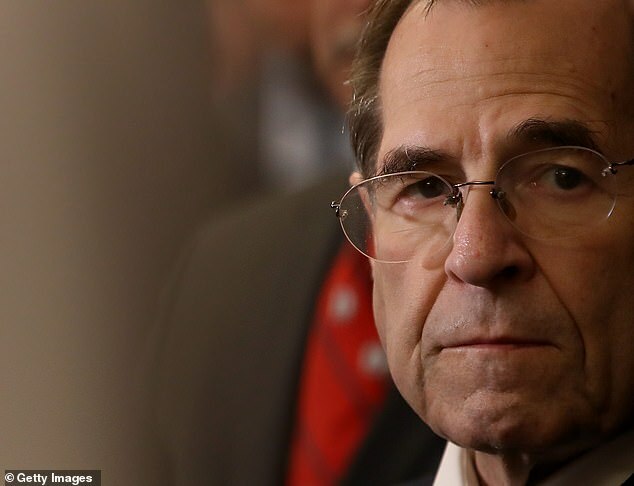 Nadler also countered the Republican argument that since Mueller was not issuing any additional indictments, it meant exoneration for President Trump and his family. ‘We know there are lots of investigations going on by other agencies. The Southern District of New York, the Eastern District of Virginia, et cetera. And there may be indictments from them. So the story is not over. We don’t know. And beyond that, we don’t know the reasons. Again, that’s one of the reasons we need and the public needs to see the report,’ he said. But for all his tough talk on continuing investigations of the president, Nadler said it’s way to early to talk impeachment. ‘It way too early to talk about impeachment or not. We have to look at – as I said, our mandate is not to impeach the president or anything like that. Our mandate is to defend the rule of law and to mitigate our constitutional liberties and to buck up the institutions that have been weakened by the attacks of this administration,’ he noted.